Welcome to The Circle, our voyage into the mysteries of The Circle of 5ths. Today it’s all in the family as we introduce the Relative Minors. 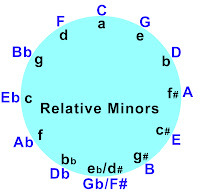 Finding a major key’s relative minor is as simple as counting up to that key’s sixth scale degree. Using our handy 5th finder we see that in the key of C Major the fifth is G so the sixth scale degree must be A. A is the relative minor of C. So what does that mean? Well, if you start on A and play all C scale notes you will have played the A Natural Minor Scale (A-B-C-D-E-F-G-A). Play it on your instrument and listen to what it sounds like. On the circle, the relative minors are depicted as lower case letters directly below their realtive majors. The relative minors also share the same key signature. For example, the Key of G has one sharp (F#) as does the Key of E minor. Observation: Count up to the sixth scale degree of any major key and you’ve found that key’s relative minor. Play the major scale notes from the sixth and you’ll be playing in that key’s relative minor key.